For the longest time I’ve heard individuals complain that the 52 Weeks Money Challenge is no joke. Yes, it start with little amounts but the amount you need to save will eventually increase each week. No wonder some failed to finish the challenge midway. However, there are steps you can take in order to make the challenge bearable and easy. This guarantees that you can be able to successfully finish the 52 Weeks Money Challenge. As a bonus, I will even throw in a step to finishing it faster than the rest. You don’t need to wait for 52 weeks to reap your rewards. Ready to hear it? Here are 3 steps to do. Step 1: Start with the goal in mind. 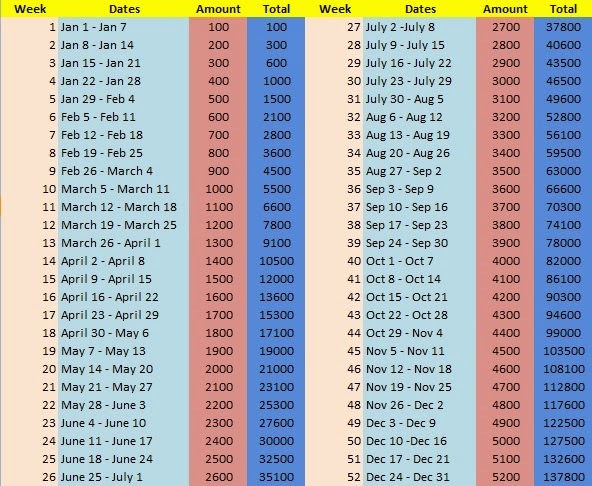 The 52 Weeks Money Challenge can be difficult and even more a chore if you don’t have a goal. So ask yourself, why are you doing this? What will you use the money for? These goals will help you motivated to do the challenge. Even if the amount keeps on rising each week, it wouldn’t be a bother since you will be using the end money for something great in the near future. You might want to use it as an educational plan for your kids or use the saved money for an investment for the next year and so on. Remember, no goals are small. Step 2: Do the challenge with someone. Two minds are better than one. In this case, two individuals or more are better than one. So instead of doing the challenge alone, it would be more fun to do it with someone. You can do the challenge with your spouse, your partner, your kids, or even the entire family. You can make it as a couple goal, or siblings goal or even a family goal. Just make sure that everyone is in the same page as Step 1 which is the goal. Make everyone contribute to the amount no matter how small it is. Get someone involved in the challenge. It would be beneficial that someone will keep tabs on when to save and how much. He or she can also do the reminding and the collection. The 52 Weeks Money Challenge would be all the more fun. Step 3: Save in advance. There are some weeks in the challenge that the amount to save would be getting high. This could really take a toll in your finances. Which is why as early as today, start saving up for those bigger amounts. 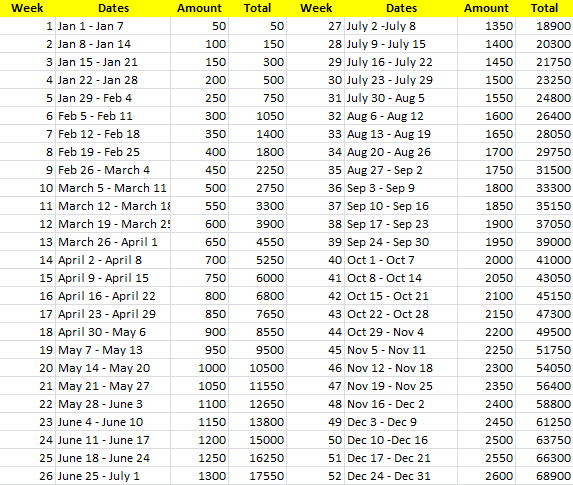 For example, if you choose to do the 50 Increment of the challenge, you can put 50 for Week 1 and put 1350 for Week 27. At least with this method, you finished two weeks already. You can do this method especially if you are paid twice a week. Every month, you can save for four weeks and save for two more weeks in advance. At least when the time comes for you to save for those future weeks, it will be made lighter to your pockets. The 52 Weeks Money Challenge can really be challenging. However, with few tweaks you can be able to make it easier and more fun on your end. Just follow these three steps for guaranteed success. P.S To those doing the 52 Week Money Challenge, it is Week 2 already! Did you deposit the next amount yet?